Today's Daily Express front page is one of those that you look at and know isn't true. You don't even need to read the rest. It's not exactly surprising that an immigration scare story that leads the Express is sourced from Migrationwatch. What is noticeable almost straight away about this one is that it hasn't reported MigrationWatch's briefing paper accurately. At all. So that's '£1million' for a family of four. Not 'each illegal immigrant to cost us £1m' or a 'staggering £1million for each newcomer'. For a start, the paper is titled: 'Potential lifetime costs of an amnesty'. The doubt implied by the word 'potential' is of course absent from the Express, who use 'would cost'. But Migrationwatch are basing their figures on highly speculative circumstances. It assumes every illegal immigrant is 25. It is assumes every illegal immigrant is going to get married and have two children who will claim child benefit for 16 years each (although it doesn't appear to assume these children will grow up and start working/paying tax). It assumes they are going to be in a minimum wage job for 40 years. It assumes they will then retire and live on pensioner credit for 15 years before dying at 80. It assumes every one of these families will spend their whole life in rented accommodation and will therefore spend 40 years on housing benefit - which amounts to £505,000 of the £1.1million 'cost' for London based immigrants. That figure alone - half the total - based on that joint assumption about rented accommodation and minimum wage, seems so highly speculative it makes the whole thing seem like pointless scaremongering. Which is, of course, what it is. The Express' editorial even admits 'the Government and the Border Control Agency are unwilling to contemplate an amnesty'. 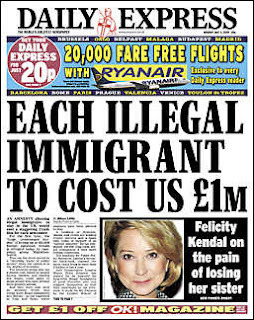 The Express do mention, in one paragraph, an IPPR report claiming that if these illegal immigrants were given an amnesty, they could pay around £1billion per year in tax. Now why wouldn't it put that figure in a front page splash? Subject to the news of immigration reform and the continuous violence of foreign nationals, and attacks on Americans by these people. To me this is a harbinger of things to come. Without any fear of contradiction that if our mostly corrupt politicians secretly pass a path to citizenship, we are going to see short outbursts of violence, that will culminate in an all out war. Because by far the largest illegal immigration has swept here from the South side of the border, they will be the ugly beneficiaries of the full impact. This nation has become a crutch for all the poor, uneducated who have broken our laws. Most have been welcomed by the business world, who are eager for large profits and shun jobs for US workers. On our streets--specially in the sanctuary cities, will run with blood. American workers have already been sacrificed by our politicians, by cutting off E-Verify to stop illegal aliens stealing jobs in the workplace. Sen. Harry Reid and majority House Speaker Pelosi must be congratulated, for their stealth in slitting the throats of millions of American Workers and favoring the criminal enterprises of pariah businesses that search-out cheap labor. The administration might be contemplating putting the National Guard on the border. But in the near future those same troops, may be needed on our own streets to safeguard both US citizens and immigrants. Just as in Europe the benefits of illegal labor has run its course, and the terrible corruption has benefited the few and not the indigenous people are angry and frustrated. Without any restrictions thousands of people have accumulated in England and insisted on their laws and regulations. To see the English people downtrodden and their livelihoods stolen will have repercussions very soon. The usual conservative and social mindset of the British people, for now they populating the once detested British National Party. My relatives who live over the Atlantic ocean have joined the membership. The British/English people are being backed into a corner, as they were during the early days of the Second World War. But when you think your values and generations of pomp and circumstance is threatened, violence will be the ultimate manifestation. The flare ups will start small but if you do not read the rural British Press on-line, you will never be served the daily additions of growing violence in this once peaceful society. And on other days it just rains. Indeed do many things come to pass. Fnord. And the 'total nutter' award goes to 'Brittanicus'. Indeed - the first deluded rant after three months of writing this blog! 'English people downtrodden and their livelihoods stolen', 'values threatened', 'violence of foreign nationals'...sounds like Brittanicus would be a shoo-in for a job on the Express if s/he ever came to the UK! "The British/English people are being backed into a corner, as they were during the early days of the Second World War." But at least we can rely on his country to help us out in a few years. I saw the same crap in the Mail and could not bring myself to cover it as it was just so wrong. Nice post. Saw this in the Newsagents and assumed it was nonsense. Nice to read that this is in fact the case - although as soon as I saw the name "Migrationwatch" I knew it!